I haven’t written this article yet because my brain has been chewing its cud here for some time. It’s not hyperbole to say this is the single most important concept guiding my analytics research and the way I think about the game. It is addressed with the briefest of kisses in the Giroud article, but it’s a topic you can write a book on and someone, at some point, almost assuredly will. As the title indicates, everything in football comes down to actions, and how successful you are at completing those actions. In short, percentages. 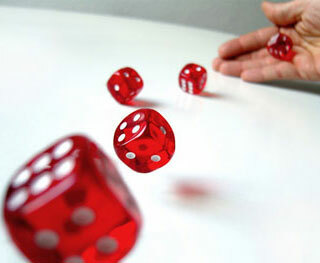 We never think about it this way, but just by playing football, you are inevitably throwing yourself into the hands of the probability gods, and the only way to push them to guarantee your favour is to create better percentages. Confused? Don’t be… there are examples bloody everywhere. The average team completes something like 400 passes a game. Barcelona at their peak have averaged over 700. A misplaced pass ends a possession, so you can only chain passes together by completing them. Simples. A 5% passing difference across your squad results in 20 extra possessions for the opposition in an average team. For Barcelona, it would instead result in 35 extra opposition possessions (though at a certain point, they won’t have the ball enough to complete all of those passes, so the possession and passing numbers go down). I don’t have the numbers for what percentage of possessions result in a shot at hand, but the chain of consequence is fairly easy to see. Missed pass, lost possession, opposing shot, opposing goal. Trickle, trickle, trickle. If the other team doesn’t have possession, they can’t score, but the only way you can keep possession is to keep completing passes. On the other hand, the only way you can score, is to complete forward passes, preferably in the final third. If you don’t complete passes in the final third, bad things will happen, even to great teams. This image from the Champions League semifinal will likely remain one of the most incredible and indelible pictures in modern football. In the match in Munich, where Barcelona had 66% of the possession against the best team in Europe, Munich completed 81% of their passes. They also somehow erected a brick wall stretching across the entire 18-yard box that Barcelona simply could not break through. This enabled Munich to take 15! shots against Barcelona and 7 of them on target. 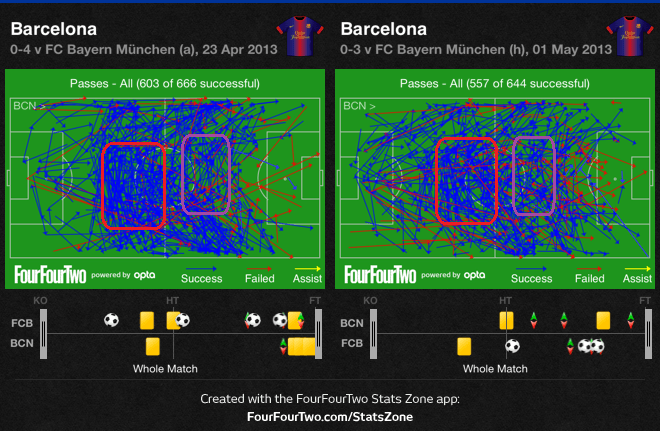 Barcelona only managed 4 shots total. Final score: 4-0. Let’s push out a bit and look at important percentages across a season. Liverpool shot the ball nearly 20 times a match last season. However, they were 6.4% worse at shooting the ball on target than Manchester United. Multiply Liverpool’s shots per game times United’s shot percentage and they likely would have ended up with 85 goals scored and 43 conceded. That’s a goal difference of 42, or one less than United posted in winning the title. Liverpool almost assuredly would have qualified for the Champions’ League. Flip it around. Aston Villa were really bad at conceding shots last season, but they were surprisingly good at not allowing them to be on target, coming in third in the league at 28.5%. Wigan gave up 2.7 less shots per game, but 33% of shots against them were on target. If Wigan’s SOTCON% was the same as Villa’s, they would likely have conceded 7 fewer goals on the season, giving them a goal differential of -19. That probably would have been good enough to stay in the Premier League. Every game has thousands of actions per team. Every season has hundreds of thousands. Even comparatively small percentage changes in critical areas (like putting shots on target, or final third passing percentages) add up quickly, and will make the difference between success and failure. So when you see me gush about how good someone like Marco Sau is at putting shots on target, this is why. And when I express discomfort at how Alvaro Negredo’s passing percentage or shots on target is below the level I would be interested in for his price, that’s also why. Teams can win with different strategies – there is still no single “right way” to play football. However, because playing football means inherently playing the percentages, the one thing that they absolutely must focus on in all of the important areas, is to do things efficiently. Thinking about it… I guess teams can also choose to do things inefficiently. They just can’t claim surprise when they don’t turn out how they expected them to.